We operate a fleet five Prime Movers, Flat Top Trailers, Drop Deck Trailers, and Floats, with a capability to carry loads up to 190+ tonne, up to 9.5-metres wide, and 55-metres long. 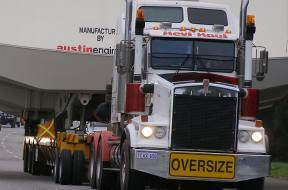 Hevi Haul provides heavy haulage transport services across Australia. Based in Perth, we specialise in moving large and oversized loads, and providing solutions for all your abnormal transport needs. When you need something large moved safely or want to hire a low loader, you can rely on us to get the job done properly and on time, as one of the best heavy transport companies in Australia. Our heavy haulage services are used for a variety of industries; including transport, mining, and construction. We can transport the largest earth-moving equipment in the country; no load is too big for us. As one of the most respected heavy haulage companies in the country, you can approach us with all your ‘impossible’ moving jobs. Our creative and talented staff members will provide a cost-effective and practical solution, and then execute it in the most professional way possible. You can trust us to move your abnormal-sized equipment to anywhere in the country, leave it to the heavy haulers that Australia knows and respects. When you work with us you can rest assured knowing that all your machinery and equipment will arrive at the intended destination on time and in the same pristine condition. Our modern and well-maintained fleet includes prime movers, flat top trailers, drop deck trailers, and floats; while our experienced and accredited drivers can transport 25 to 190-tonne loads. With your heavy haulage transport sorted, our project management team will take care of all the bureaucracy, including permits, pilot vehicles, police escorts, rail and power line approvals, traffic management, and anything required to transport your load from A to B. You will also receive regular updates on the progress of your transport job, from the time it leaves to its arrival at its destination. At Hevi Haul, we have established ourselves as a company that gets the job done. We work hard to maintain that reputation, delivering quality and reliable Australia-wide haulage services. You know we can move the largest, most complicated piece of equipment, including oversized, and overweight loads that require specialised transport equipment and knowledge. Choose us and join the list of satisfied companies who rely on us time and time again as their heavy haulage transport service provider of choice. From Terex, Komatsu and RCR Tomlinson, to Austin Engineering, they all choose us for their big moves. They do this because we always provide a reliable and professional service. We see solutions where others see obstacles.